Website Design is an Art, period. It is critical to business success and will continue to define our cultural horizon far into the future. How can I keep my website current? What colors should I use? How do I show the world I mean business? INTELIGIT knows how to get the job done. We utilize the latest graphics technology and leverage our talent to make your vision a reality. Need: This client had been in business for several years and needed to grow its market share. A new site was created to reflect the well-deserved accolades and professionalism of this organization today. A SPIRIT-FILLED, LOVING, ACTIVE congregation with a multitude of opportunities. Assisting lenders and investors with asset management solutions. 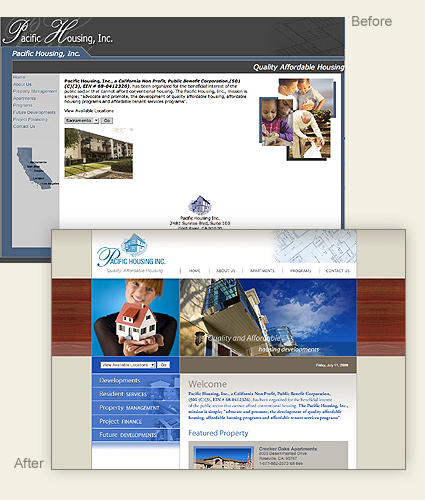 A Sacramento based housing company dedicated to providiing affordable housing developments and programs. A church bringing people together through evangelism, prayer, ministry, missions and outreach. Providing complete foreclosure services throughout California. Law Offices of Mark A. A non-denominational, diverse, Spirit formed church, located in beautiful downtown Sacramento. A non-denominational church whose goal and focus in life is to be Christ-like. Provider of professional tree and lawn care service to residential, commercial, municipal and utility customers. © 2010 INTELIGIT All rights reserved.